Governor Dodge State Park has numerous rock features. Some are suitable for climbing, and some (perhaps most) are not. The overarching consideration for anyone climbing at Governor Dodge should be climbing only on formations that can hold up to the abuse. The rock here is Sandstone, and some of it is solid. Much of it, though, is fragile or crumbly and should be left alone. 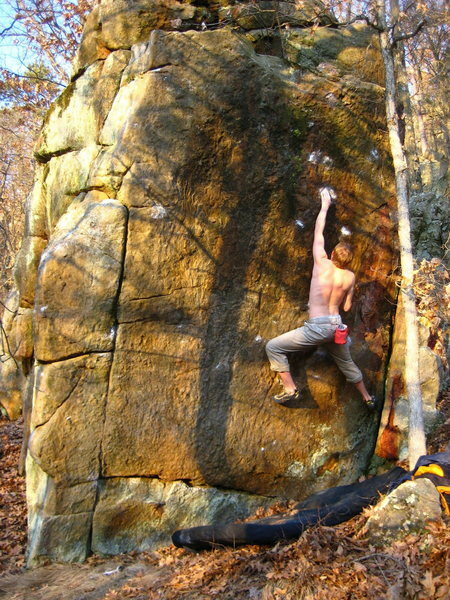 The rocks came before the climbers, so the rocks have the right to remain. Climbers aren't exactly adored by the DNR, so be overly considerate of the rock and other park users. 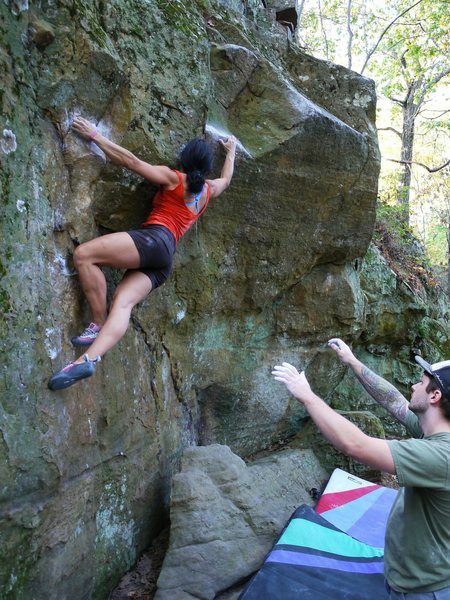 The climbing history at Governor Dodge is not nearly as storied as it is at Devil's Lake, so we as climbers can take nothing for granted (not that you should at the Lake, either). There are some bolted routes at Governor Dodge. When the DNR found these it did not make them happy, so further bolting of routes is not acceptable. That said, enjoy! See Qual Wall for the bolted routes, Deutschlander Wall for TR's and the remainder are bouldering areas. Katie on Highly Executed, Group B east side of Backbone Ridge. The Wisconsin Bouldering Guidebook, which features bouldering at Devil's Lake and Governor Dodge, published alongside the Minnesota Bouldering Guidebook, is currently available online from Escape and at retail locations throughout the Midwest. A second guidebook featuring Devil's Lake is reportedly nearing completion. If you show up in WI without pads, you can buy a pad at Boulders Climbing Gym in Madison or Wildside in Baraboo (call before going to make sure they have one in stock). You can also rent a pad from Focus Boardshop/Wisconsin Climbers Association on the east side of Madison. All three locations currently stock the Wisconsin Bouldering Guidebook. From Madison, take Hwy 18/151 to Dodgeville. Turn right (north) on Hwy 23 until you come to the entrance a few miles up the road. The park is on the east side of Hwy 23. 1. Climbing is not disallowed at the park, we are simply another user group. Please do not do anything to jeapordize our relations with the park. 2. If climbing near a campsite, do not park at that site if there are people camping there or hike through if they are at their site. Find another way to the rock. Most areas have alternate directions. 2a. Please note the new parking recommendations for the Qual Wall and Lonely Boulders noted on the Qual Wall page. 3. No fixed anchors may be installed, ie. no bolts. 4. Holds break at the Dodge but please don't climb if it's obviously wet!!! The Boy at Stephen's Falls. New Year's Day 2009. Stephen's Falls. New Year's Day 2009. Yet another Stephen's Falls shot with the Boy. Stephen's Falls, Governor Dodge SP. April 08. Sweatpants, I'd be happy to make any changes that you see fit. Just email me and let me know. The following several comments are in response to a comment about bolting new routes that has since been deleted. -Anyone caught installing anchors will at least severely damage climber relations with the park staff. And perhaps arrested I think, but consequences were not discussed. -If there are campers in Group Site B do NOT walk through the site!!!! Please either park at the paved parking lot with the multiple bathrooms and walk up the hill or park in the gravel parking lot and head down the road a bit and then up the hill. They were VERY concerned about this! -Please do not cut branches or try to establish trail. Park staff have been moving logs in the way to try and stop new trails from being worn in. They have better things to do with their time. TREAD LIGHTLY!! -Do NOT drive around closed gates!!! The number one negative incident they remembered about climbers was when someone (who shall remain nameless) drove around the gates to Camp B. This was a MAJOR issue because it interfered with their sharpshooting! In addition to group camp B, I think that would apply to Twin Valley North and The Complex as well. Hello wisconcin folks...Im planning a visit to this area and was fishing for advice. Never been to this park, plan to treat it with the utmost respect, but als plan on getting lost. Is there a map of the bouldering anywhere? 10 minute hikes can turn into epic never-finds at some places, is the dodge like this? whats the best plan of attack to find the problems in general? Nick were the stolen biners zip tied? As usual the Ninja simply says what everyone is thinking to themselves. Eero, I have thought about doing an overview of the park bouldering areas, but you would still need the directions since it would be way too "bird's eye" to be useful for navigation. 1. Avoid problems with very uneven landings. These often require multiple pads - one on the rock and one below, for example. 2. Avoid problems that traverse - I'd rather fall from a little higher onto a pad than sprain my ankle on a tree root. 3. 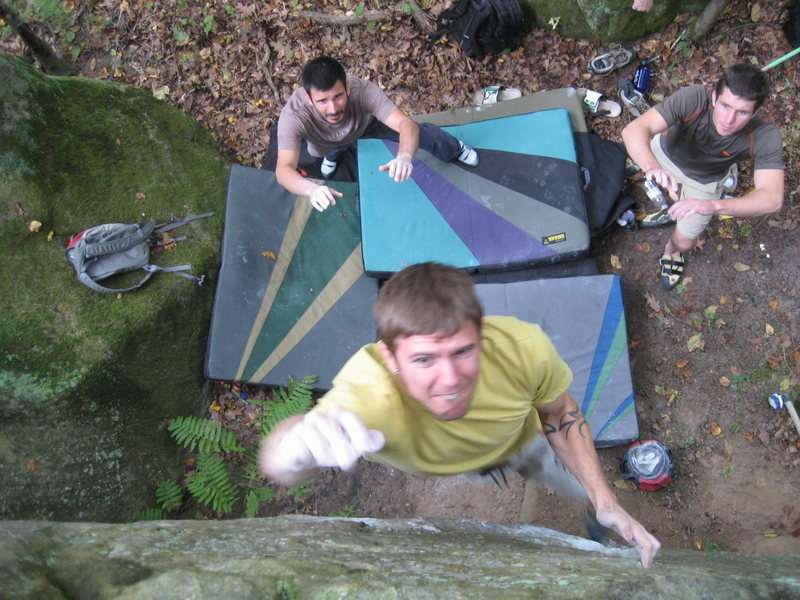 Consider investing in an organic slider pad (organicclimbing.com/collect…) - they are incredibly useful for covering pesky rocks and free you up to use your pad in the main landing area. 4. Use sweatshirts similarly. Or stuff a puffy jacket into a durable backpack to prevent it from being ripped when used to augment your pad.